Celebrate Acadiana --- Celebrate Louisiana --- Celebrate BACON! Acadiana is comprised of 22 Louisiana Parishes. 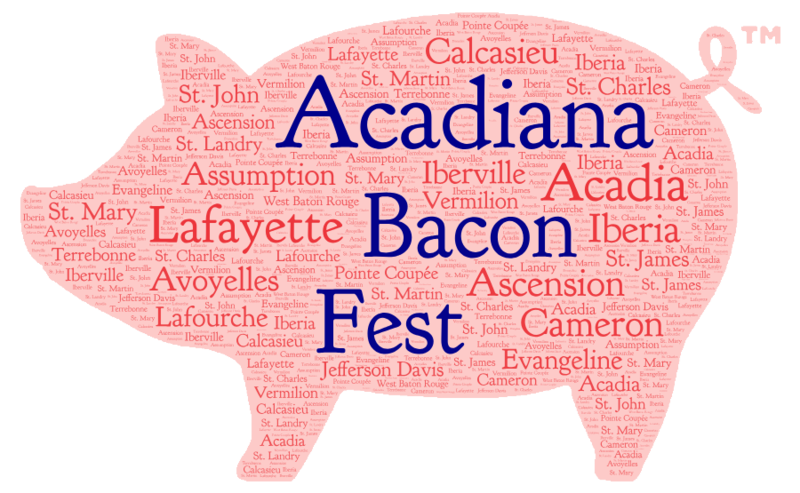 The Acadiana Bacon Festival will bring restaurants and home cooks from each Parish together where they'll show off their very best bacon dishes with cash awards in several categories. There will be entertainment, games, bacon themed fun of all kinds, and plenty of unique bacon dishes to sample. PARTICIPANTS -- We are currently accepting entries from restaurants or cooks in each of the Acadiana Parishes. Represent your Parish and represent your culinary know-how. Bacon has to play a starring role in whatever you make! SPONSORS -- We are seeking sponsors at all levels to help make this event really Oink! NON-PROFIT PARTNER - In addition to sponsors we are looking to partner with an appropriate non-profit group to be the beneficiary of proceeds from the event. The ACADIANA PARISHES – Acadia, Ascension, Assumption, Avoyelles, Calcasieu, Cameron, Evangeline, Iberia, Iberville, Jefferson Davis, Lafayette, Lafourche, Pointe Coupée, St. Charles, St. James, St. John, St. Landry, St. Martin, St. Mary, Terrebonne, Vermilion, West Baton Rouge. To learn more about Acdiana visit the Lafayette Convention and Visitors Commission.